Don “The Dragon” Wilson has made some great movies (Cyber-Tracker 2). He’s made some near great movies (CyberTracker, Future Kick). And he’s made some not so great movies which I know is sort of a “duh” statement, but if you’re still not convinced by the sheer common sense of this, see Night Hunter. Still, I think we all knew that he had a really horrid, tedious movie in him (and probably several, if we’re being honest with ourselves) that emphasized his natural blandness while failing to emphasize his strengths such as diving out of the way of exploding cars and brawling with cyborgs. 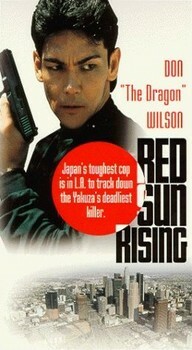 Red Sun Rising is the film where we finally lose our game of Don The Dragon Russian Roulette. Of course in real Russian Roulette, the loser is put out of his misery in a few seconds whereas Red Sun Rising bleeds you to death for over an hour and a half. The opening scene sets the brain-petrifying tone for the all that is to follow. Don The Dragon plays a half Japanese/half American cop in Japan who’s trying to bring in a bad guy named Yamata. You would think that anything involving Don The Dragon wailing away with a sword when he’s not kickboxing his way through thugs would be yen in the bank. But it isn’t. 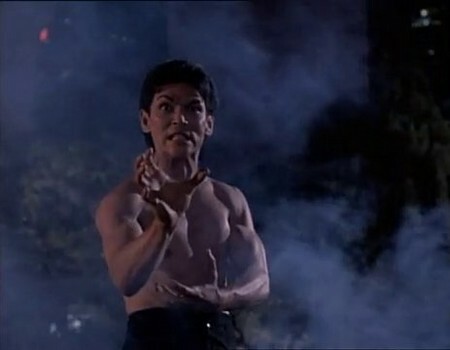 In spite of being credited with being something called “Executive in Charge of Fight Action,” Don The Dragon’s battles throughout the film are marked by being slow, poorly photographed, and not all that interesting. The overuse of slow motion during already sluggish fighting is also not recommended. After his fight in Japan against Yamata that leaves his partner dead, Don The Dragon comes over to the United States four months later to bring Yamata back. Considering that his Japanese superiors blamed him for the loss of his partner because he was only half Japanese and that we have no idea how or why Yamata is in the U.S. anyway, this development makes as much sense as the whole “gang war” storyline that’s clumsily introduced in L.A. in between Don The Dragon’s Japan and U.S. sequences. It turns out the overused gang angle is foisted on us to bring Don The Dragon’s mismatched American cop buddy into the film. It’s a woman (Detective Karen) and she doesn’t like Japanese people! And you know why she doesn’t? Her dad worked at a car plant in Michigan and lost his job when import cars started becoming more popular so he took a job someplace else and got killed during a robbery! So she became a cop and started hating the Japanese! Don The Dragon hates Americans though because of some good old fashioned prejudice from his American side of the family. But if Don The Dragon is going to ever master the Death Touch so that he can defeat Yamata’s super powered assassin, he’ll have to come to terms with both sides of his heritage! Why? Because that’s what his kung fu master says! Death Touch? Super powered assassin? Kung fu master? Am I really sure this movie is that bad? The Death Touch is just a guy poking you with his fingers turning different colors accompanied by a weird sound effect. The super powered assassin is a guy who spends a lot of time waving his arms around in people’s faces somehow putting them into a trance despite the fact that the only trance such actions would put anyone in is the sort of trance where you’d laugh in his goofy face. The assassin also demonstrates how evil he is by breaking into the kung fu master’s house, killing his parakeet, and stealing Detective Karen’s prized pocket watch! He was clearly sending a message. And that message was, I killed your bird and stole a watch, so beware my Death Touch! Especially if you are a bird or a watch! The most consistently annoying part of the movie was all the really bad dialogue where the characters tried to show how much they hated each other’s culture. None of it was funny (as we always hope racist dialogue is), but what I didn’t really get was how they had Detective Karen repeatedly harassed by a male cop who also constantly made racist comments to Don The Dragon. Obviously, we were supposed to hate that guy. Fine. But the problem is that when this guy wasn’t saying rotten stuff to Don The Dragon, Detective Karen was saying similarly racist things to him instead! But I was supposed to like her! Why? Because she was played Terry Farrell of Star Trek: Deep Space Nine fame! It’s Dax! Surely, it’s just that alien parasite living inside of her that made her spew such vitriol! Watching her play a tough racist cop who gets put on suspension, gets it on with Don The Dragon, and survives the Death Touch had me thinking that the whole freaking movie was just some massive Holodeck malfunction! The off-putting characters we’re supposed to like (even the kung fu master is too cutesy for his own good), the barely existent action, the muddled plot involving selling weapons, inciting a gang war, crooked cops, and the cheesy karate powers occasionally displayed (smoke bombs, invisible forces knocking people down, the trance that made Dax hot and bothered and the not-quite-Death Touch) all serve to make this movie a skip at all costs affair. I don’t think Geordi ever caused a Holodeck disaster this bad, even when he was trying to get laid!